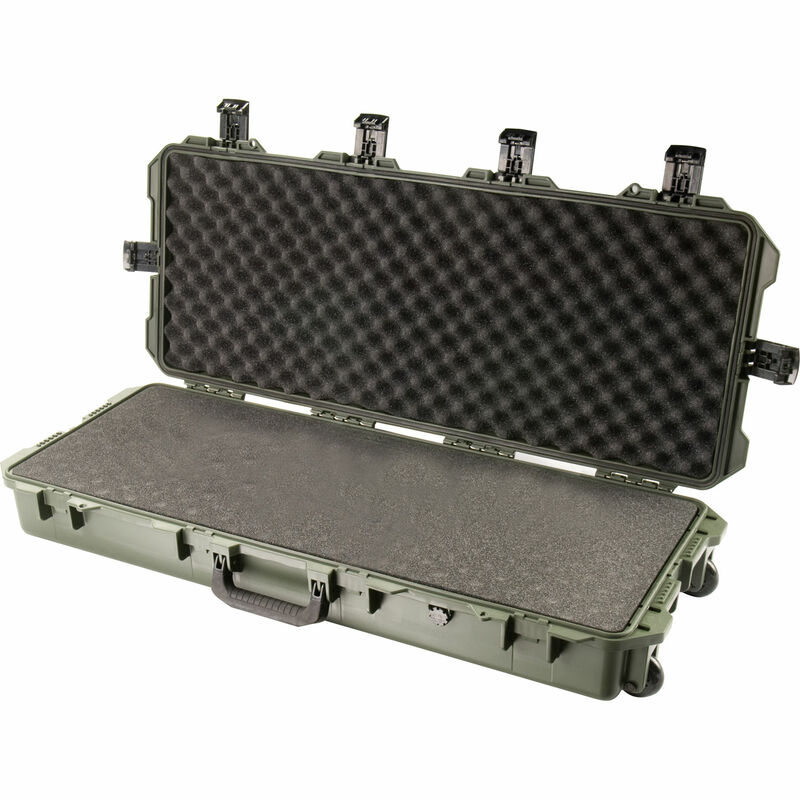 The Pelican iM3100 Storm Case with Foam (Olive Drab) is an injection-molded case made of HPX high performance resin, that is virtually unbreakable, dent-resistant and shatter-resistant. It is tough, rugged, lightweight, airtight and watertight. There is a permanently attached Vortex valve that automatically adjusts air pressure without letting in water, and won't unscrew from the case. Press & Pull latches open with the push of a button, yet stay closed securely under impact or stress. The case has unbreakable molded-in hasps that allow the addition of standard size padlocks. It has hinges with integrated feet that hold fast under impact, and create a flat surface for upright stability. It is transported by two double-layered, soft-grip, solid-core handles and rugged in-line wheels. Box Dimensions (LxWxH) 40.5 x 17.0 x 7.5"
iM3100 Storm Case with Foam (Olive Drab) is rated 4.9 out of 5 by 40. Rated 5 out of 5 by HH60witch from Excellent AR-15 hardcase with room for ammo and accessories Bombproof and childproof construction. Replaced my Drago twin 36in soft-case with tons of accessory pouches within a day due to lack of weather-proofing, and more importantly - security. The iM3100 is the same quality you would expect from Pelican but slightly lighter tham the Mil-spec case I had to bag drag around from Fl to Afghanistan. 4 lock positions for security and keeping the curious away. Customized to fit anything you need to take to the range - and you can order the foam separate if you mess up the layout or upgrade for more toys. Highly durable, secure and will last forever. If you have lasers and optics - this is the case you must have. Rated 5 out of 5 by onehitwonder from Excellant quality. Great service. I originally purchased a pelican 1700 case and found it to be even better built and more durable than the storm case but found the latches to hard to open and lock. So I returned it and ordered the Pelican storm iM3100 which is about the same size and weight. The latches on the storm are much better. Easier to lock and open and secure just as good as the 1700. The case itself is made of a different material, although lifetime warrentied, the 1700 case seem more heavy duty, military grade, whereas the iM3100 is more consumer grade, which suites my needs perfectly. Rated 4 out of 5 by Cases4Cases from Solid Case - Seal Could Be Better I've always bought Pelican Cases. This was my first Storm case. I like the wheels and the fact that there are side latches. But I'm not a fan of how the case seals. With standard Pelican Cases, it takes a little effort to latch them, which always gives me confidence that the o-ring seal is working properly. The Storm case closes almost too easily. I don't have the same confidence in the o-ring and that it is sealing well. I'm also more of a fan of the flat foam in the lid - the Storm comes with the convoluted foam pad, which I don't like as much. Rated 4 out of 5 by Ambidextrous from Great product and service Great product as always with Pelican products. I've been using it as a carrier for my weapon systems and have already put it through the stress test. Like I said before, no disappointments which was to be expected. The only thing that could be changed is the weight, and the only problem with that is it's a little on the heavy side if you have to move quickly with it. Especially with your equipment inside. Other than that nothing bad to say, excellent product. Rated 5 out of 5 by davidDFW from quality case as you would expect this is my 2nd rifle case. my first case was made by Plano and is about $ cheaper. I thought it was a good case -- and it was for the money -- but this case is far superior to that one.the solid foam of this case is more dense than the pick-and-pluck foam of the Plano case and seems to be lasting longer.while initially a little more difficult to custom fit your items, the end result looks much better than the pick-and-pluck foam -- especially diagonal lines. the pick-and-pluck foam also is starting to separate so all of the solid areas where pieces were not removed look like an array of little columns of foam instead of a solid surface like the Pelican foam does.lot of videos on YouTube about best ways to arrange your layout and cut your foam. I have to agree that a cheap electric knife is probably the best tool for the job. How much does this case weigh with only the foam in it (i.e. no gear)?